I think the much important think is that a CTF map is mirrored ! 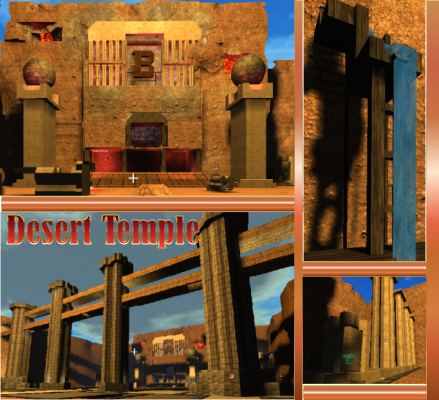 Then I try to make 3 diffrent ways into the Temple. You can go by the sides (teleporter, jumppad) or throw the entrance. After that I try to make the flag postion so that its very hard to camp there. Therefore i add the lava in the temple and open the temple so that you can attack a camper from outside. I try to add more details in this map andmake it bigger than the last one. For CTF I add some lava, e.g. in front of the stairs, so a flag holder has to watch out where he's going to. The lava inside the temple has a water layer, so if someone fells down he's not immediately dead. I also added bases for Capture, so there are 7 bases. Thanks to apflstrudl who helped me by the lighting and for his tipps and thx to Jorge who give me nice feedback and found some bugs. besides the mapping skills the general idea of the mirrring and the layout of the map really is good. it would be a fun map to play on! hope we manage to play it again! as it is still alpha-stage and i rate it with respect to that stage to give you an incentive to work on it some further i give it a 4/5. Maybe you could think of expanding the space between the two temples. Right now one just needs a few seconds to get from one side to the other. The map seems a bit too fast imo (although it might work well this way for 4 or 6 players). Edit: Although not yet beta, there are so many improvements in this new version of your map. And I know you're gonna keep improving, so 4/5 at this stage. There are too many capture bases for may taste. The dt2.png file is not shown when loading the level in game. AFAIK only jpg files are used.